My siblings and I would literally jump with joy, when amma announced that there was “kalale” for dinner. 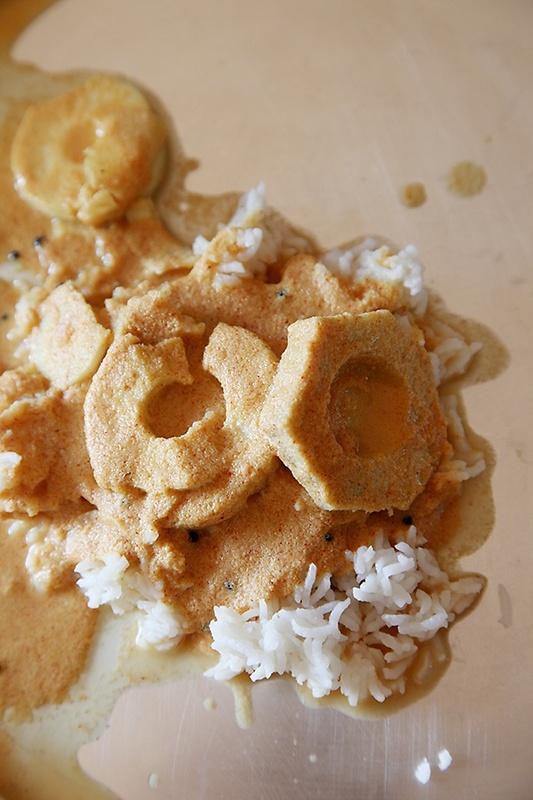 Bamboo shoot curry known as “kalale” in our native language was always the highlight of the monsoon season. Last month, when I was visiting my parents, I put up a video of my mother chopping tender young bamboo shoots on facebook and instagram, after which there were many requests for this recipe. So, ladies and gentleman, boys and girls, I present to you my mother’s bamboo shoot curry recipe. Before we proceed to the making and eating of this exotic curry, the arduous task of preparing the bamboo shoots for cooking presents itself, as a hurdle or something mundae or a joyous task, depending on how one looks at it. Bamboo shoots have a tough exterior that requires many layers of peeling before the aromatic and tender insides are revealed. And then is the process of chopping into slices or small pieces, depending on what one wants to cook. Once the bamboo shoots are cut into the desired shape, they are soaked in water for 3 days with a fresh change of water everyday. This is supposed to remove all the bitterness and also make the bamboo shoots easier to digest. Different communities have different methods of preparing the bamboo shoots for cooking. In China, bamboo shoots have been one of the prized forest vegetables and have been eaten for more than 2500 years. In Japan, bamboo shoots are regarded as the “king of the forest vegetables”, revered for their nutritional content. Recent study also proves that bamboo shoots can prevent cancer and be used to treat a host of other diseases. If you live in Karnataka, bamboo shoots are hard to come by as the Government has made the felling of bamboo trees illegal in the forests, where they thrive. 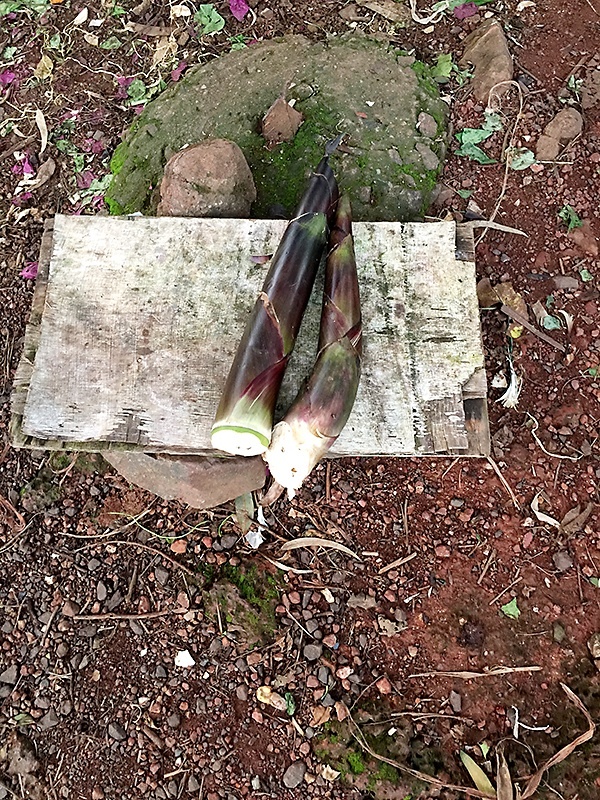 One has to rely on the shoots grown in the backyard or private land (if one is lucky) or on the bamboo shoots given by friends and family who have the fortune of accessing them easily and legally. 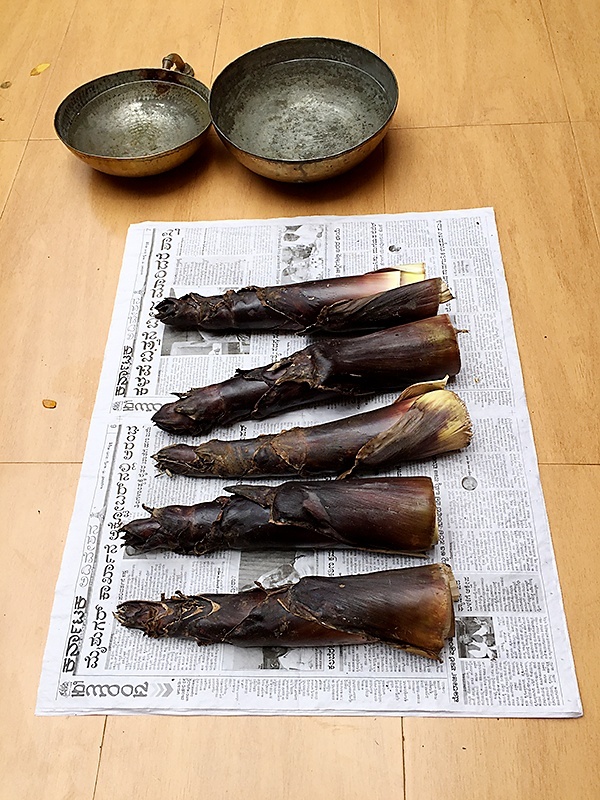 In other parts of India, like Goa and some north eastern states where bamboo shoots are eaten and relished, they are sold in the markets openly. 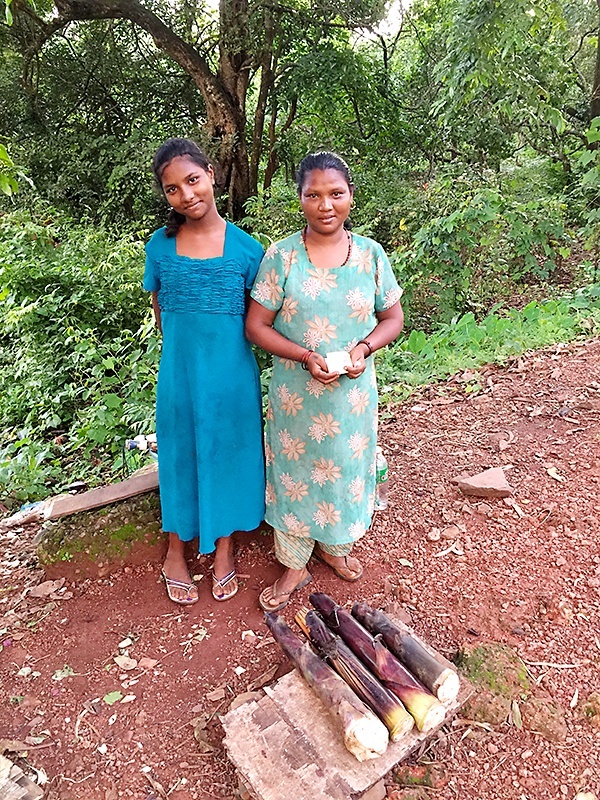 I came across these two lovely girls selling bamboo shoots on the road in Goa, where our Muslim cab driver stopped by, to purchase them. Later on, he told me that his mother makes a delicious curry with bamboo shoots that is a speciality of that region. My mother makes three variations with tender young bamboo shoots. 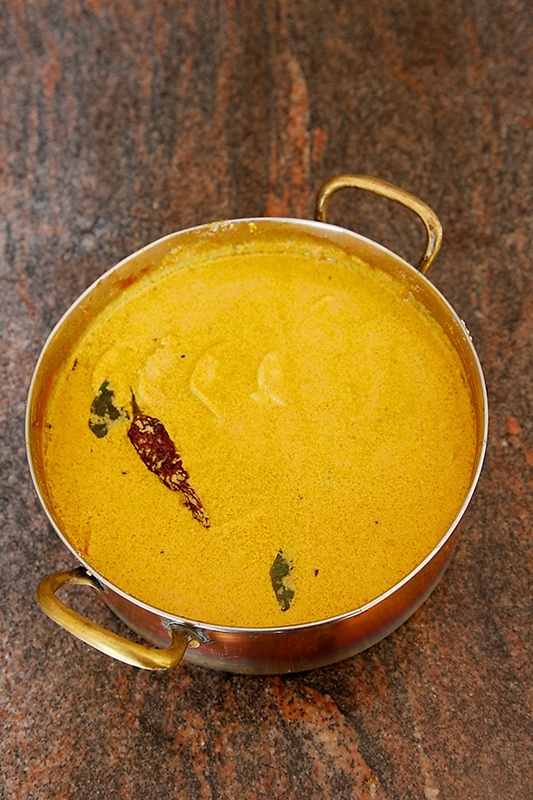 Huli- a preparation with dal, Palya- a dry preparation made with coconut oil and enjoyed with hot rice and this curry. Coriander seeds and dry red chilies are the prime spices used to grind this curry. These spices enhance the taste of the curry and at the same time ensure that the delicate fragrance of the bamboo shoots is not submerged. A plate of hot rice with this aromatic bamboo shoot curry prepared by my mother takes me back to another era and to a time when life was blissful and magical, a time that you call “childhood”! My mother’s bamboo shoot curry is very popular in our family and with our friends. And now you can make it too. And if you don’t have access to bamboo shoots, then don’t fret! Substitute it with any other vegetable of your choice and you will be good to go! 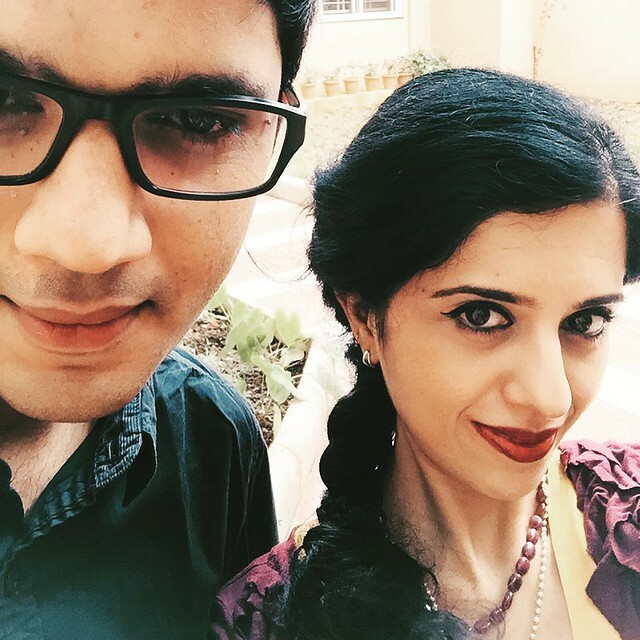 And I would like to take your leave, with a shot of my brother and me, two happy souls after eating the bamboo shoot curry, cooked by my mother. You can replace the bamboo, with any vegetable of your choice. Peel the outer leaves of the bamboo shoot until the tender white portion is revealed and then slice them. Place the bamboo shoots in a large bowl of water, cover and keep aside. Change the water everyday for three days and then the bamboo shoots are ready to be cooked. In a wok put in the coconut oil and stir in the coriander seeds and dry red chilies. Fry the seeds until they turn aromatic. 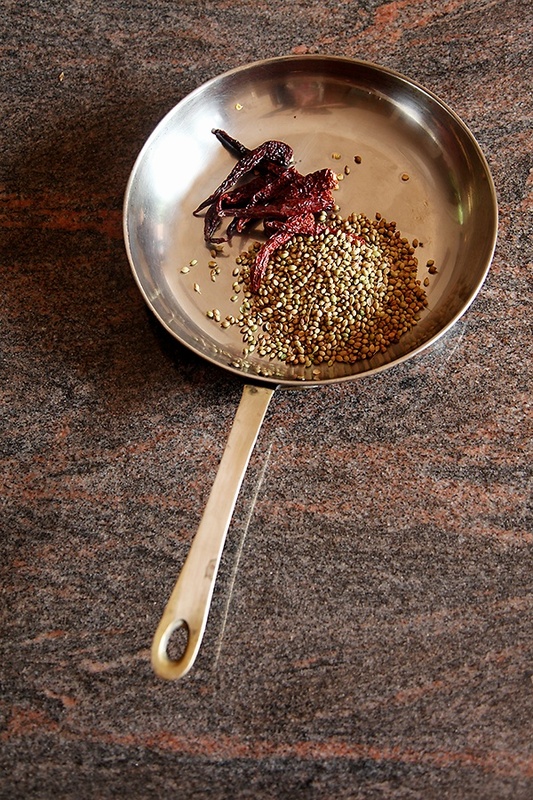 In a blender, put in the coconut, coriander seeds and dry red chilies and grind to a smooth paste. In a large pot, put in the bamboo shoots, cover with water and cook until tender. Stir in the ground paste alongwith the kokum leaves and bring to a boil. Once the curry starts to simmer, it is time to prepare the seasoning. 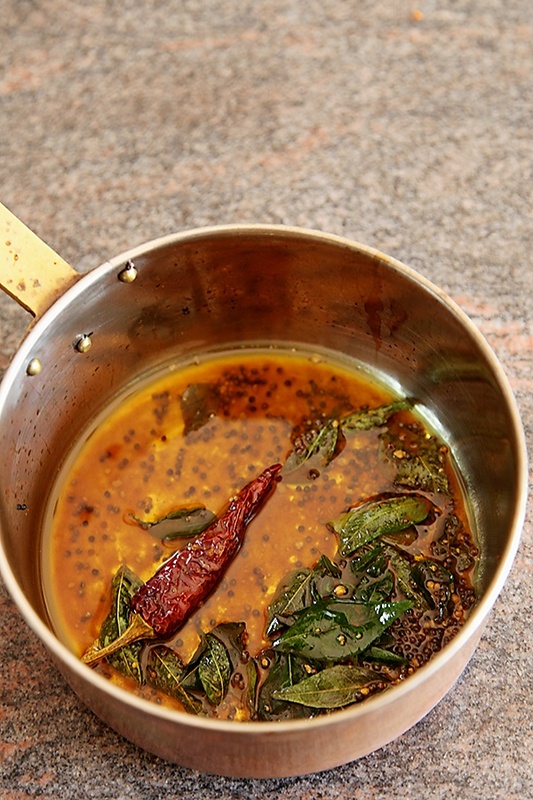 In a small seasoning pot, put in the oil and when the oil is hot, pop in the mustard seeds. When the mustard seeds start to splutter, put in the asafetida, dry red chilies and the curry leaves. Put in the salt, mix well and serve hot. wow, thank you sooo much for this. Much appreciated! Wonderful recipe. 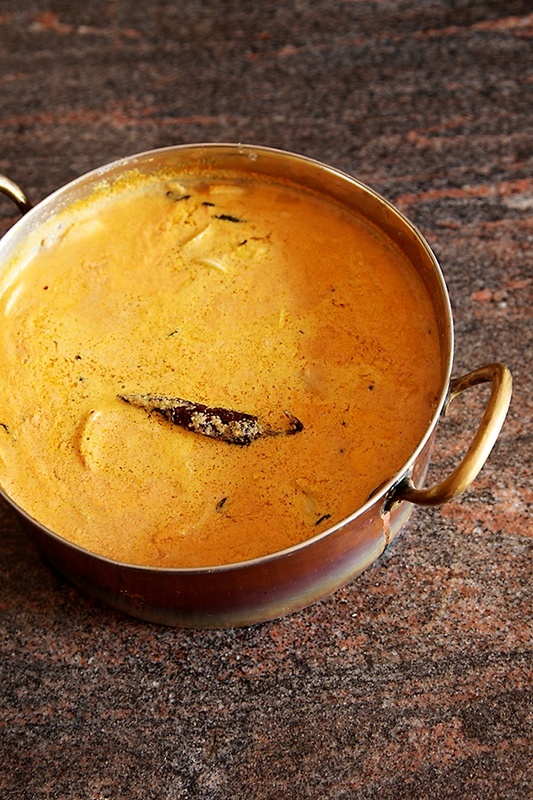 The curry looks so yummy in the image that I don't want to resist myself from trying this recipe!! Thanks!! Tamara- It is a yummy recipe. If you try it, I will be happy to know your feedback! Please publish Bambooshoot Huli recipe. The dish looks great! I live in Europe and fresh bamboo is not easy to come by. 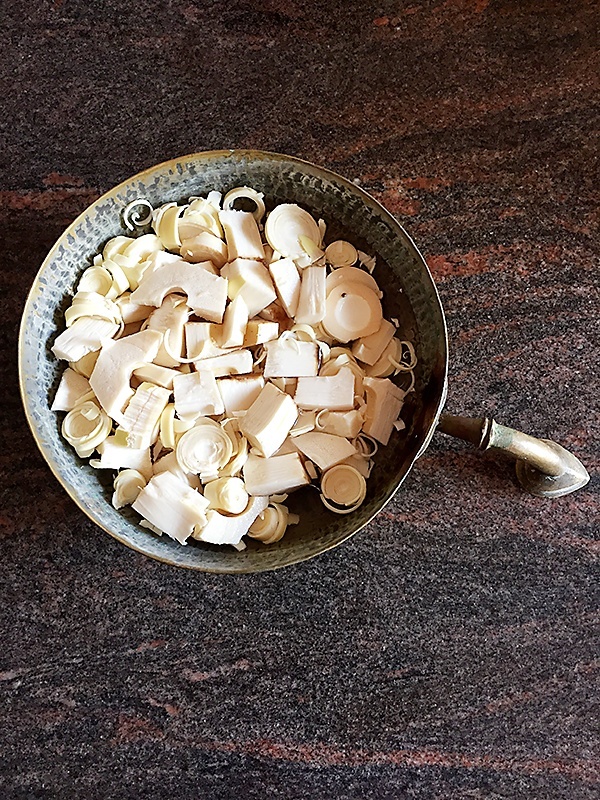 Do you think that I may use instead canned bamboo shoots? I really want to incorporate more bamboos as I have read that they are great for our digestive system but most recipes are Thai or Chinese recipes and mostly including soy sauce in the ingredient list and which I try to avoid. Many thanks in advance…. 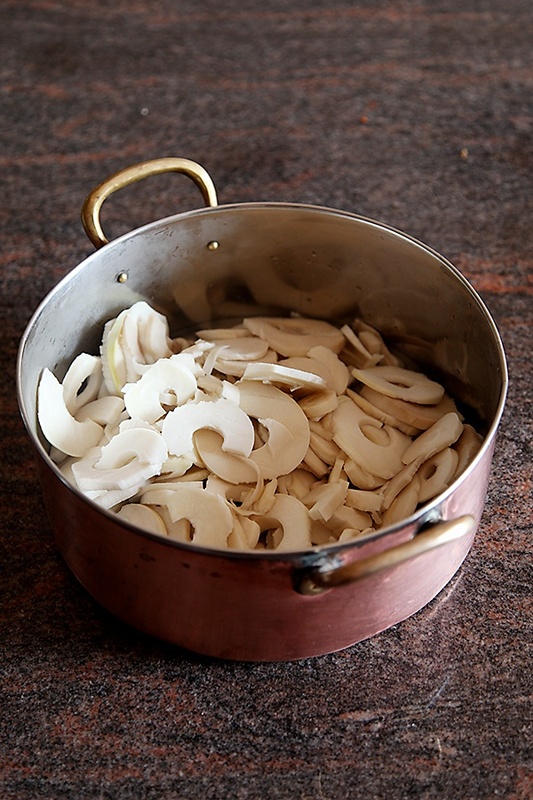 Sudhakara- You can use my vegetable huli recipe and replace the vegetables with bamboo shoots. lee thomas: Bamboo is so difficult to get even here in India. You can use canned bamboo if you want to try the recipe.